In Judaism, Abraham is called Avraham Avinu or Abraham, our Father. God promised Abraham that through his offspring, all the nations of the world would be blessed (Genesis 12:3). In Christianity, Abraham is referred to as a man who walked by faith (Hebrews 11) and it was counted unto him as righteousness. And Shaul (Paul) describes Abraham as an example of righteousness by faith (Galatians 3:16). In Islam, Abraham, also known as Ibrahim in Arabic, is considered the father of Ishmael and his descendants - the father of the Arabic people. He is also considered to be a Muslim prophet. Judaism, Christianity and Islam all refer to Abraham as their spiritual father and are considered Abrahamic religions. God made a covenant with Abraham and promises to the descendants of Abraham and those from the nations who embraced those promises. Originally, Abraham was known simply as Abram. "As the sun was about to set, a deep sleep fell on Abram; horror and great darkness came over him. Adonai said to Abram, 'Know this for certain: your descendants will be foreigners in a land that is not theirs. They will be slaves and held in oppression there four hundred years. But I will also judge that nation, the one that makes them slaves'... After the sun had set and there was thick darkness, a smoking fire pot and a flaming torch appeared, which passed between the animal parts. That day Adonai made a covenant with Abram: 'I have given this land to your descendants - from the wadi of Egypt to the great river, the Euphrates River - the territory of the Kenites, Kenizzites, Kadmonites, Hittites, Perizzites, Rephaites, Amorites, Canaanites, Girgashites and Jebusites.'" In the scripture above, God makes a unilateral unconditional covenant with Abram. The land from the wadi of ancient Egypt to the Euphrates River was to be given to his descendants. God also prophetically speaks of the enslavement of his descendants for 400 years. Historically, only the descendants of Jacob fulfilled this prophecy, and then God supernaturally released them from Egypt's Pharaoh on Passover. Before Abram had any children, God told Abram that his descendants would be as many as the stars in the heavens (Genesis 15:5-6). Because Sarah was old and barren, she suggested that Abram sleep with her handmaiden - Haggar the Egyptian, so that Abram could fulfill God's promise with off-spring. He did and Haggar had a son - Ishmael. God then made a promise to Haggar, Ishmael and their descendants. paid attention to your misery. living his life at odds with all his kinsmen.'" Abram was 86 years old when Ishmael was born. Thirteen years later God spoke again to Abram concerning an eternal blessing and covenant with Abram and his off-spring. "When Abram was 99 years old Adonai appeared to Abram and said to him, "I am El Shaddai (God Almighty). Walk in my presence and be pure-hearted. I will make my covenant between me and you, and I will increase your numbers greatly." Abram fell on his face, and God continued speaking with him: "As for me, this is my covenant with you: you will be the father of many nations. Your name will no longer be Abram (exalted father), but your name will be Abraham (father of many), because I have made you the father of many nations. I will cause you to be very fruitful. I will make nations of you, kings will descend from you. "I am establishing my covenant between me and you, along with your descendants after you, generation after generation, as an everlasting covenant, to be God for you and for your descendants after you. I will give you and your descendants after you the land in which you are now foreigners, all the land of Canaan, as a permanent possession; and I will be their God." God promised to increase Abram's off-spring; God changed Abram's name to Abraham, meaning "father of many nations;" God establish an everlasting covenant with Abraham's descendants to come; God promised the land of Canaan as a permanent possession; God promised to be their God. God gave Abraham a directive and a procedure that would signify God's covenant. The directive was for the people to observe the covenant of circumcision - Brit Milah. "God said to Abraham, "As for you, you are to keep my covenant, you and your descendants after you, generation after generation. Here is my covenant, which you are to keep, between me and you, along with your descendants after you: every male among you is to be circumcised. You are to be circumcised in the flesh of your foreskin; this will be the sign of the covenant between me and you. Generation after generation, every male among you who is eight days old is to be circumcised, including slaves born within your household and those bought from a foreigner not descended from you." God again promised that Sarah, Abraham's wife, would bear a son at age 90 and that the covenant would be established with him. "Sarah your wife will bear you a son, and you are to call him Isaac (laughter). I will establish my covenant with him as an everlasting covenant for his descendants after him. But as for Ishmael, I have heard you. I have blessed him. I will make him fruitful and give him many descendants. He will father twelve princes, and I will make him a great nation. But I will establish my covenant with Isaac, whom Sarah will bear to you at this time next year." So Abraham circumcised himself at age 99 and Ishmael who was 13 years of age, and all other male slaves (servants) among his household. A year later, we read in Genesis 21:4 that Abraham circumcised his son Isaac on the eighth day after his birth, and Abraham was 100 years old. 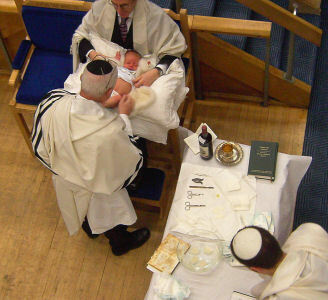 The commandment of circumcision on the eighth day is still practiced within Judaism, regardless of a Sabbath or Yom Kippur (John 7:22-23). Why? To fulfill God's covenant and promise to Abraham. It should be noted that Muslims also practice male circumcision when a boy is usually around 10-12 years of age. Their circumcision is not done as a sign of God's Abrahamic covenant that was later reiterated with Isaac and Jacob, but rather for hygiene reasons. Islam's Hadith mentions five natural things that one does: removing pubic hair, circumcision, trimming a mustache, removing underarm hair, and cutting of nails. There are also some cultures that practice female circumcision which is not commanded anywhere in the Bible and often results in genital mutilation. Physical circumcision has been an important religious practice for Jewish males in acknowledging God's covenant with Abraham. The Israelites, and servants and foreigners among them, were commanded by God to be circumcised before eating the Passover lamb and leaving Egypt (Exodus 12:40-51). Again, after 40 years of wandering in the Sinai wilderness, Joshua instructed the Israelite males to be circumcised before entering the Land of Canaan (Joshua 5:2-7). Yeshua (Jesus) was circumcised on the eighth day (Luke 2:21) and was presented by his parents at the Temple, a month after birth fulfilling the rite of Pidyon HaBen - "Redemption of the First Born" (Luke 2:23) thus fulfilling the Torah (Exodus 13:2; Numbers 18:15). Circumcision is mentioned numerous times in the New Testament. yourselves, above all peoples, as he still does today. and do not be stiff-necked any longer." quench it, because of how evil your actions are." God wants a relationship with his people Israel and it is described as circumcision of the heart, meaning, the people receive a spiritual heart of love, devotion and obedience towards God. There were times when the Children of Israel were close and faithful to God, and times when they were not. Not unlike many of us today. "For circumcision is indeed of value if you do what Torah says. But if you are a transgressor of Torah, your circumcision has become uncircumcision. Therefore, if an uncircumcised man keeps the righteous requirements of the Torah, won't his uncircumcision be counted as circumcision? Indeed, the man who is physically uncircumcised but obeys the Torah will stand as a judgment on you who have had a circumcision and have Torah written out but violate it. For the real Jew is not merely Jewish outwardly: true circumcision is not only external and physical. On the contrary, the real Jew is one inwardly; and true circumcision is of the heart, spiritual not literal; so that his praise comes not from other people but from God." "Blessed are those whose transgressions are forgiven, whose sins are covered over; Blessed is the man whose sin Adonai will not reckon against his account. Now is this blessing for the circumcised only? Or is it also for the uncircumcised? For we say that Abraham's trust was credited to his account as righteousness; but what state was he in when it was so credited, circumcision or uncircumcision? Not in circumcision, but in uncircumcision. In fact, he received circumcision as a sign, as a seal of the righteousness he had been credited with on the ground of the trust he had while he was still uncircumcised. This happened so that he could be the father of every uncircumcised person who trusts and thus has righteousness credited to him, and at the same time be the father of every circumcised person who not only has had a circumcision, but also follows in the footsteps of the trust which Abraham our Father had when he was still uncircumcised. "Was someone already circumcised when he was called? Then he should not try to remove the marks of his circumcision. Was someone uncircumcised when he was called? He should not undergo circumcision. what does mean something is keeping God's commandments." What is rabbi Shaul (Paul) saying here? If you are a Jewish believer in Yeshua, then do not try to remove the signs of your Jewishness by living like the non-Jews. And if you are a non-Jewish follower of Yeshua, then you do not need to become Jewish to be obedient to God. But rather, it is more important that both should obey the commandments of God and walk in faith. James 2:23-24 states "Abraham had faith in God, and it was credited to his account as righteousness. He was even called God's friend. You see that a person is declared righteous because of actions and not because of faith alone." And Abraham's faith in God began before he was physically circumcised. It is circumcision of the heart and obedience that are important to God. are called the Circumcised) at that time had no Messiah. You were estranged from the national life of Israel. You were foreigners to the covenants embodying God's promise. So then, you are no longer foreigners and strangers. and members of God's family." Rabbi Shaul (Paul) speaks of the non-Jewish believers being grafted into the Jewish olive tree in greater detail in Romans chapter 11. There should be nothing replacement about being grafted into the House of Israel. Yeshua, referring to the non-Jews in John 10:16 stated, "Also I have other sheep which are not from this pen; I need to bring them, and they will hear my voice; and there will be on flock, one shepherd." Yeshua was referring to the prophectic words found in Isaiah 56:8 which state, "Adonai Elohim says, he who gathers Israel's exiles; 'There are yet others I will gather, besides those gathered already.'" The prophet Isaiah speaks of the foreigners joining themselves to Adonai and the people of Israel; observing the biblical Sabbaths; holding fast to God's covenant; going to God's holy mountain; and praying in God's house of prayer for all the nations. It also speaks about those who put their faith in the God of Abraham, Isaac, and Jacob; who love the God of Israel and the people of Israel; and who embrace the Messiah of Israel. One people, one God, one Messiah, and the "one new man" expression spoken about in the New Testament. Acts chapter 15 records a special council that was convened in Jerusalem by the Messianic Jews to discuss and determine if the non-Jewish people coming to faith in Yeshua the messiah needed to be circumcised according to the laws of Moses. Some of the Pharisees who had become believers in Yeshua raised the issue. Kefa (Peter), Shaul (Paul) and Bar Nabba (Barnabas) shared how the non-Jews were placing their faith and trust in Yeshua and how the non-Jews were filled with the Holy Spirit. Yaakov (James) then spoke up and reminded the brethren that the phenomenon was a fulfillment of prophecy, and he proceeded to quote Amos 9:11-12 "When that day comes, I will raise up the fallen tabernacle (sukkah) of David. I will close up its gaps, raise up its ruins and rebuild it as it used to be, so that Israel can possess what is left of Edom and of all the nations bearing my name," says Adonai, who is doing this." Having shared his thoughts about the many non-Jews accepting Yeshua, Yaakov (James) stated his opinion that physical circumcision would be an obstacle for non-Jews coming to faith. And after much study and discussion, it was decided that the only initial requirements for non-Jews to join the messianic Jewish sect would to abstain from things polluted or sacrificed to idols, from sexual fornication, from blood, and things strangled. 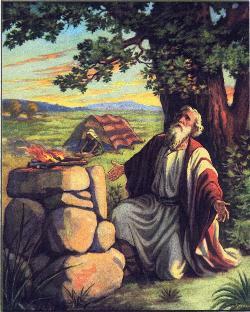 Yaakov (James) went on to say that writings of Moses were read in the synagogues on every Sabbath, suggesting that the non-Jews attending the Shabbat services would hear the Torah and learn what God's instruction was for them, and allow God's Holy Spirit to bring them further understanding. What the Jerusalem Council decided was this - for the non-Jews it is more important to be circumcised in one's heart, than to be physically circumcised. Note that the Jerusalem Council did not abolish Torah observance for the Jews who believed in Yeshua. It is interesting to note that 2000 years ago the issue facing Messianic Jewish believers was this: "What do we do with all the non-Jews who are accepting Yeshua?" Now, 2000 years later, the question non-Jewish believers are asking is just the opposite: "What do we do with all the Jews who are accepting Yeshua and want to continue living as Jews?" How ironic. even more numerous than your ancestors. and all your being, and thus you will live. and obey all his commandments that I am giving you today." The promises God made concerning Israel remain, and those who hate and persecute Israel will reap God's judgment, because they are not fighting against Israel, but against the God of Israel. God calls Israel the pupil of His eye (Zechariah 2:8). God has preserved the people of Israel and will continue to do so, for the sake of His Holy Name, as the prophet Ezekiel declares in Ezekiel chapters 36 and 37. Calling Abraham our father is about maintaining a faith relationship with the God of Abraham. It is about being a part of the Kingdom of God rather than the kingdom of this world. It is about knowing God the Father through the earthly ministry of His Son - Yeshua. It is about allowing God to circumcise our hearts - our innermost being, which is more important to Him than just having outward physical circumcision. When Yeshua's followers asked to see God the Father, Yeshua responded that if they had seen him - Yeshua, they had seen the Father - because he was sent to do God the Father's will. So to understand God, one must become acquainted with His Son who came and lived among us. Yeshua demonstrated what circumcision and the Abrahamic covenant are all about. now or ever,' says Adonai." indeed, he went out without knowing where he was going. who were to receive what was promised along with him. as the grains of the sand on the seashore."